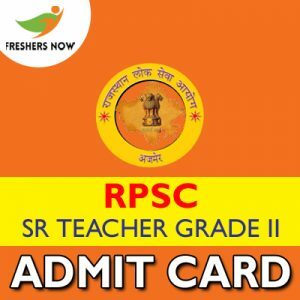 RPSC Sr Teacher Grade II Admit Card 2019: Good news for the applicants of the RPSC Sr. Teacher Gr II Recruitment 2019 that the RPSC Sr Teacher Grade II Hall Ticket is Released On 12th February 2019. Besides, the RPSC Sr Teacher Grade II Exam Date 2019 is conducted from 17th February 2019 To 20th February 2019. So, with this in mind, every candidate should prepare well and get focused on the main areas of the Written Test. Also, the RPSC Sr Teacher Selection Process 2019 is carried out in 3 rounds which are clearly mentioned in this post. Furthermore, for more details of rpsc.rajasthan.gov.in Sr Teacher Grade II Admit Card 2019, go through the entire page. After applying for the RPSC Sr Teacher Grade II Recruitment 2019 may eagerly wait for the RPSC Sr Teacher Grade II Exam Date 2019. Since it has been scheduled from 17th February 2019 To 20th February 2019. The candidates should prepare well from today itself because attempting and getting a govt job is not an easy task. Rajasthan Public Service Commission is recruiting for the Sr. Teacher Gr II (Sanskrit Education Dept.) and released the Exam Dates. Go through the entire post to get all the remaining details. Candidates are advised to keep their RPSC Sr Teacher Grade II Admit Card 2019 safe till the joining. Candidates should bring the printout of their RPSC Sr Teacher Grade II Hall Ticket 2019 in the examination hall. A candidate is advised to validate all the details on their RPSC Hall Ticket. Rajasthan Public Service Commission(RPSC) assigned the duty of conducting the RPSC Sr Teacher Selection Process 2019 to a separate Selection Committee. This process includes the Written Test, Personal Interview, Document Verification. Also, you know that the Written Test to done in order to clear the scrap from the participants. Moreover, the selected candidates are promoted to further round of the Selection Process i.e., Personal Interview. After that, the qualified candidate has to attend for the Document Verification. All the candidates are suggested to carry any one of the below mentioned documents for the security purpose to the Examination Hall along with the rpsc.rajasthan.gov.in Sr Teacher Grade II Admit Card 2019. Initially, Applicants should open the Rajasthan PSC website, rpsc.rajasthan.gov.in. Now, the Home page appears on the screen. Then, search for the latest notification for RPSC Sr Teacher Grade II Notification 2019. Again, Search for the RPSC Sr Teacher Grade II Admit Card 2019 download link. Click on the link and fill the required details like Name Of the Candidate, Application Number, Date of Birth of the candidate. Submit the details and download the RPSC Sr Teacher Grade II Hall Ticket 2019. Download and keep it safe until you take it to the Examination Hall. Also, the admit card is useful at the time of Joining. Got all the details about RPSC Sr Teacher Grade II Hall Ticket 2019? Similarly, you can get the updates of Latest Jobs, Admit Cards, Results, Previous Papers form our webportal Freshers Now. Moreover, Leave a comment to clarify your doubts.